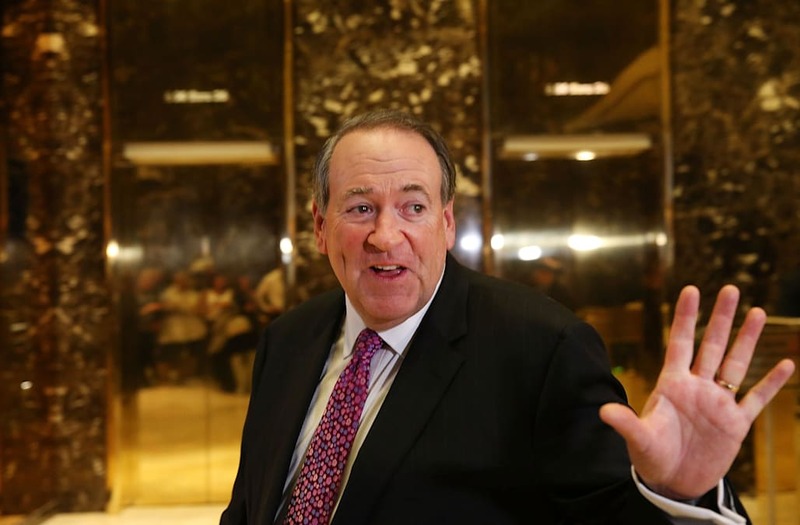 Mike Huckabee has been firing off quite a few tweets recently. Breaking News! Jimmy Dean Sausage Co will be renamed GORSUCH SAUSAGE because he's grinding up some Democrat Senators into PURE PORK SAUSAGE! The violence the tweet implies reminded a few social media users of a story about how Huckabee's son, David, once allegedly killed a dog at Boy Scout camp. Huckabee has been sharing his humorous political commentary on Twitter for quite some time now -- it started when he suspended his presidential campaign on Feb. 1, 2016. Leahy at Gorsuch hearing is more effective than Ambien in inducing sleep; He makes Hillary look like a candidate for Dancing w/ the Stars! Trump may be a car wreck, but at least his car is pointed in right direction. Hillary is a drunk-driver going the wrong way on the freeway. Watch celebs spew ignorant political venom at Oscars?? Nah...think I'd rather have a colonoscopy. Both happen from same location. Lady Gaga left politics out but added some high octane talent. She needed to drop the mic. She crushed it. Obama gives Israel middle finger; gives Iran wet kiss; he's hates Israel for building bedrooms more than Iran for building bombs. I Tweet for my amusement and your amazement. To haters trolls and humorless people-you really shouldn't follow me. It's way over your head! WEATHER ALERT: D.C. Government offices shut down by #Snowzilla & that means no work is being done. How's that any different than normal? CNN launching its own social media platform to rival Zuckerburg's-Zucker vs. Zuckerburg. CNN will call their new site "FakeBook." Crack journalists at CNN have "fake journalist" guest saying Trump sneaked his own taxes to him. Best comedy on TV! How low can they go?? Rachel Maddow will release HER tax returns on her show tomorrow. Or maybe not. Why not? Might show how much the Russians paid her! Don't miss it! Rachel Maddow will reveal who shot J. R. Ewing on the series "Dallas." Sure it was the 80's, but it's RACHEL MADDOW! Tomorrow night Rachel Maddow solves the Kennedy Assassinaton. Will name Oswald as assassin. Don't miss REAL JOURNALISM! News flash! Rachel Maddow knows who won the 2016 World Series and will spend 30 minutes of her next show teasing the winner. Liberals end CA drought by crying river of tears cause mean ol' @realDonaldTrump fired Obama political appointees! Kleenex stocks up 400%! Some goon on CNN going postal because new administration is replacing US attorneys like it's unusual. CNN-Crazed Newsless Nuthouse.